My Sweet Haven: Fisherman's Wharf. I love this place. It is so serene and relaxing. This is the Aquatic Park in Fisherman's Wharf San Francisco. It has a nice little strip of beach where young and old alike can frolic to their heart's content. The nicely kept green grass can be a favorite spot for a little tan under the sun. (not that I need it!) I did find a good place to sit while I enjoy the sweeping views of Alcatraz, the Golden Gate Bridge, the SF skycrapers from afar and just watch people taking walks along the waterfront. There is a huge Ghirardelli Square nearby so I decided to go there afterwards and get some sweet little treat for hubby. I got him an Intense Dark Twilight Delight Bar, it's sooo good! I've never really been a big Starbucks girl, but I thought why not go to one this time and grab a cup of iced coffee of some kind while I continue my nice little walk down the Hyde St. Pier. It was particularly interesting to see those historical ships that were restored beautifully. At the pier, I found a good spot to capture decent shots of the beautiful San Francisco skyline, as well as the widely-known Alcatraz "The Rock" Island. This used to be a federal prison for 29 years. I wish I had more time, I would have loved to take a ferry and join the island tour. 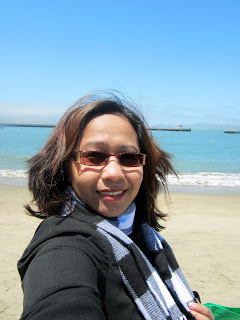 I definitely had a great time on my short 2 day-trip to San Francisco. I enjoy taking pictures and I must say this city has one of the amazing picturesque views I've ever seen.